The Boston Conservatory received a B.
Washington Monthly's ranking of 232 out of 277 of National Universities - Overall Rank was a major contributor to this grade. 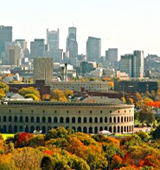 The Boston Conservatory is college with 545 students located in Boston, MA. What are the top 3 reasons someone should attend The Boston Conservatory? What is a typical The Boston Conservatory student like? Describe the type of person that should attend The Boston Conservatory. Boston Conservatory students are driven in their chosen art form but also friendly and supportive. The Conservatory encourages a collaborative and positive atmosphere. The intimacy of our class settings provides a student-centered atmosphere that is uniquely intensive and supportive. Since its founding in 1867, The Boston Conservatory has shared its talent and creativity with the city of Boston, the region, and the nation, and continues to grow today as a vibrant community of artists and educators. Armed with new energy and new ambitions, the Conservatory is in the midst of a revitalization from top to bottom, setting the stage for new achievements for the institution and our students. We prepare and inspire our students to perform at the highest level in their art and in their lives. We foster their creativity and give them courage. We teach them the skills that will lead to professional and personal fulfillment. The Boston Conservatory was founded in 1867 by Julius Eichberg to serve as both a professional training academy and community music school. Eichberg, a gifted violinist and composer, brought with him the spirit and musical practices flourishing in the great conservatories of Brussels, Paris, Prague, London, and Vienna--but with a difference. From the very start, the Conservatory broke new ground by opening its doors to women and African Americans, people with few professional opportunities in classical music at the time. The Conservatory is also credited with several other important "firsts." After merging with the National Associated Studios of Music at the start of the 20th century, The Boston Conservatory expanded its offerings in several innovative ways. The Conservatory incorporated dance and theater training into its curriculum, created the first "grand opera" department in the United States, and developed the first professional training program in dance to offer equal emphasis on European classical ballet and the uniquely American forms of modern dance. Today, The Boston Conservatory is an independent private college with fully accredited programs in music, dance, and theater. Our student and faculty performances are a consistent and valued part of Boston's cultural life. Our community service program allows us to reach out beyond our walls to various constituencies across the city. Our success is visible both in the learning environment, and in the professional accomplishments of our graduates. What are the top 3 things that students do for fun at The Boston Conservatory? The average student pays $43,208 for tuition, fees, and other expenses, after grants and scholarships. Total stated tuition is $38,800, in-state and on-campus, before financial aid. Want more info about The Boston Conservatory? Get free advice from education experts and Noodle community members.